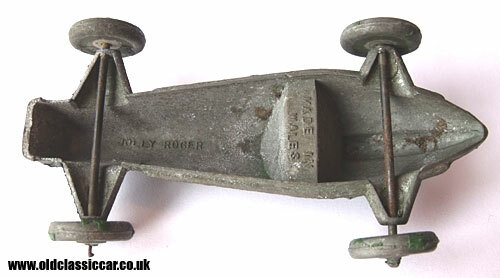 Diecast toy racing car named Jolly Roger. 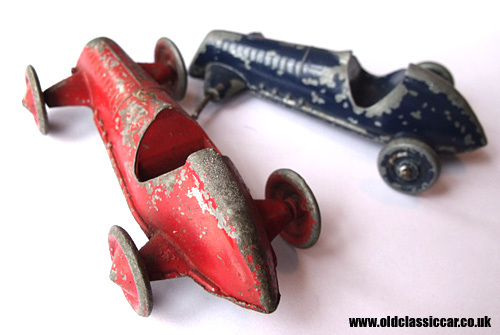 'Jolly Roger' toy racing cars. Each of the diecast toy racing cars shown here is marked with the trademark name, Jolly Roger, and the inscription "Made in Wales". They were produced by Tremo Mouldings Ltd of Cardiff. All appear to be made from the same basic mould, although there are some very minor detail differences between each car shown above. The green and the incomplete blue racer have different wheels compared to the red example, yet all appear to be original to their respective vehicles. I've also a few other examples with different manufacturer's stamps underneath, and at least one features a slight tail "fin", unlike those shown above, suggesting that the moulds were used for some time, by different companies. 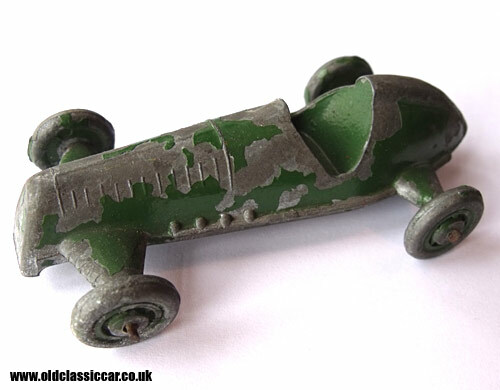 Reading around it seems that the Jolly Roger cars, produced for just a few years in the late 1940s by Tremo Mouldings Ltd, were based on moulds acquired from French manufacturer Gasquy-Septoy. The racer is loosely based on a Maserati single-seat racing car of the period. Tremo Mouldings Ltd also produced a car based on a 1939 Plymouth sedan, and a caravan under the Jolly Roger name. 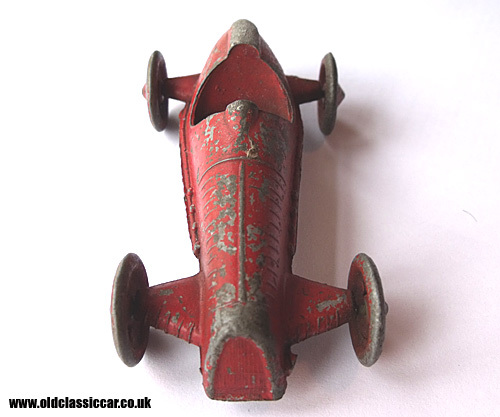 The toy racing car measures four inches in length.